In the aftermath of what seems to have been an orgiastic office party, its semi-naked participants stumble through their discarded clothing – pausing only to indulge in a few fevered morning-after gropes – as they race against the clock to prepare the scene for the start of the working day. Cramming fluorescent skirts and feather boas into boxes and cupboards, they step into the formal attire of the 1920s civil service, while up in his grimy bedsit, after a night alone, their secluded, excluded colleague Pushpin pulls on his ill-fitting suit – and all to the pounding throb of Mark E. Smith and The Fall. It’s a period-punk mash-up to make Michael Clark proud. And that’s just the beginning, because in this balls-out brilliant adaptation of Gogol’s 1835 short story Diary of a Madman, Chris Goode constantly plays with theatrical form and context, fusing contemporary cultural imagery and meta-theatrical flourishes with the experimental flair of the Modernists to make the tale of lowly civil servant Pushpin’s psychological collapse a full-volume howl against current injustices and intolerance. Trapped in the repetitive cycle of bureaucratic banality, bullied by the idiotic representatives of the institutions he is expected to respect, and ground down by social and economic inequality, Pushpin is the tormented outsider whose descent into insanity seems the only rational response. Dashing about on Janet Bird’s excellent multi-level set, constantly out of step with the codes and practices of the world around him, Pushpin moves from wistful adoration of the boss’s daughter Sophie (a splendidly haughty Gemma Brockis) to dedicated night-time stalker to dog-converser and ends with total derangement via a stint as self-professed king of Spain. As Pushpin, Lucy Ellinson gives an astonishing performance, delivering a supercharged caricature of eccentricity with a physically elastic virtuosity that is extraordinary (prompting an audience member in the post-show Q&A to ask, ‘when did you realise that your face was so stretchy?’). 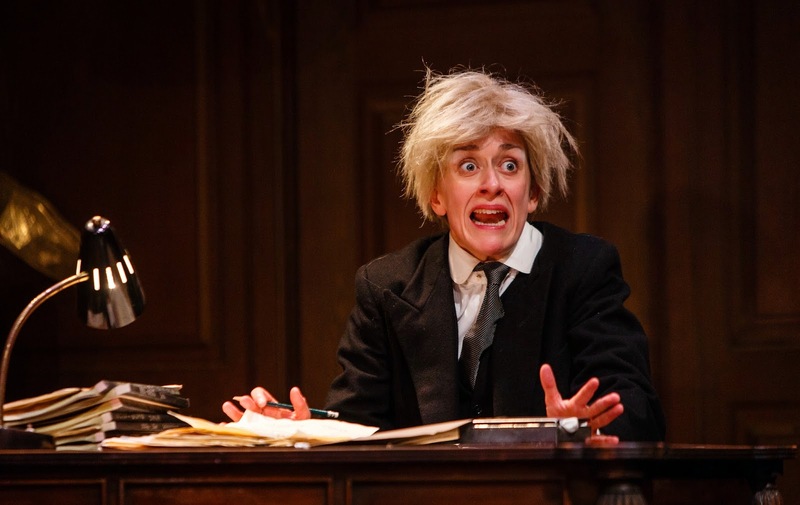 Elaborately gestural and hugely expressive under a hay-coloured fright wig, Ellinson wrings hilarity from Pushpin’s growing sense of dislocation from reality, as his external behaviour becomes ever more closely aligned with the madness of the inner voice. The comedy continues until Pushpin, in full psychotic flight as the Spanish sovereign, finally dismantles the theatrical construct entirely and in doing so seems to find a kind of peace, or at least a sense of personal vindication – until the mechanisms of control reassert themselves once more and we witness the shocking brutality of ‘reality’ forcibly imposed on the free-thinking outsider. With talking dogs, a dance freakout complete with gold mirror ball and an interplanetary alignment of questionable taste, Mad Man is fast, fun and thrillingly original. And Lucy Ellinson will convince you in everything she does to the very last second.